With the presence of a large pool of participants, the global aircraft seating market is displaying a highly competitive business landscape, finds a new research report by Zion Market Research (ZMR). Zodiac Aerospace, B/E Aerospace Inc., RECARO Aircraft Seating GmbH & Co. KG, Geven S.p.A., Aviointeriors S.p.A., Acro Aircraft Seating Ltd, Thompson Aero Seating Ltd, and HAECO Americas LLC are some of the key vendors of aircraft seating across the world. These players are focusing aggressively on innovation, as well as on including advanced technologies in their existing products. Over the coming years, they are also expected to take up partnerships and mergers and acquisitions as their key strategy for business development, states the aircraft seating market study. Citing an instance, in August 2018, Turkish Airlines decided to fit MiQ® seating facility for the business class cabins of its new medium-haul, single-aisle aircraft fleet. Reportedly, initial shipment of 92 ship sets for its Airbus A321neo airplane along with delivery of 77 ship sets for is Boeing 737 MAX jet is in pipeline. As estimated in this report, the global aircraft seating market stood at US$ 771.08 million in 2016. 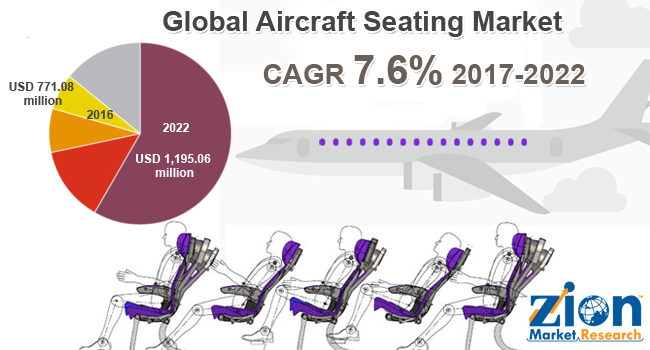 Witnessing a tremendous rise during the period from 2017 to 2022, the revenue in this aircraft seating market is expected to reach US$ 1,195.06 million by the end of the forecast period. The main components available in this aircraft seating market are seat actuators, foams & fittings, and others. "Burgeoning demand for air travel as a result of swelling disposable incomes along with massive popularity of commercial air travel is forecast to embellish the growth of aircraft seating market in the coming decade,” says the author of this study. Apart from this, growing preference for seat actuators will further foster the expansion of aircraft seating market size. In addition, emerging premium air travel trends witnessed among the travelers is likely to generate more sales of advanced seat actuation systems, thereby contributing remarkably towards aircraft seating market revenue. Massive preference for aircraft interiors along with meteoric rise in aircraft deliveries and increase in the number of aircraft upgradation programs are expected to notably pile up the growth of aircraft seating market in the next few years. Regionally, North America has been leading the worldwide aircraft seating market and is anticipated to continue on the dominant position in the years to come, states the aircraft seating market study. Massive demand for aircraft seating witnessed across developing countries of the region along with flourishing of the trade & tourism activities in APAC is the main factor behind the dominance of the Asia Pacific aircraft seating market. Rise in the disposable incomes of the middle class population in countries such as China and India is likely to make substantial contribution towards the growth of this regional aircraft seating market in the near future. In addition, lucrative demand for new aircrafts and rapidly surging air traffic in Asia Pacific will further drive the business space in the years ahead.